This collection of This I Believe essays gathers seventy-five essayists―ranging from famous to previously unknown―completing the thought that begins the book's title. 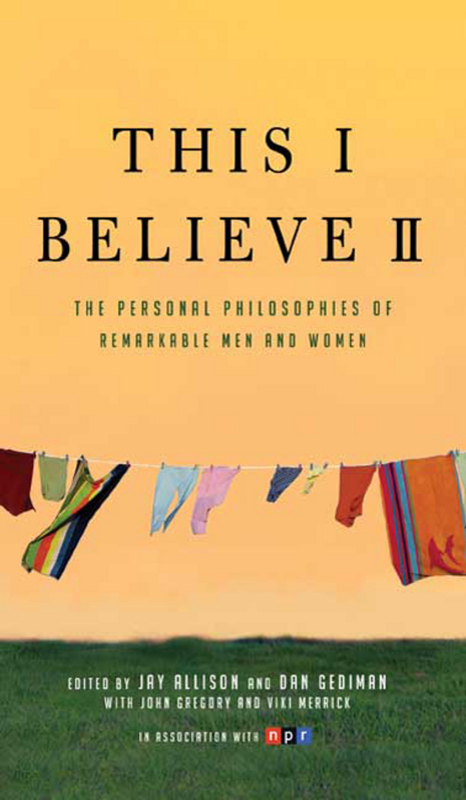 With contributors who run the gamut from cellist Yo-Yo Ma, to professional skateboarder Tony Hawk, to ordinary folks like a diner waitress, an Iraq War veteran, a farmer, a new husband, and many others, This I Believe II, like the first New York Times bestselling collection, showcases moving and irresistible essays. Included are Sister Helen Prejean writing about learning what she truly believes through watching her own actions, singer Jimmie Dale Gilmore writing about a hard-won wisdom based on being generous to others, and Robert Fulghum writing about dancing all the dances for as long as he can. Readers will also find wonderful and surprising essays about forgiveness, personal integrity, and honoring life and change. Here is a welcome, stirring, and provocative communion with the minds and hearts of a diverse, new group of people―whose beliefs and the remarkably varied ways in which they choose to express them reveal the American spirit at its best. The author will speak on campus at a time to be determined. Wes is the author of "The Work: My Search for a Life That Matters," which released Jan. 13, 2015, as an instant New York Times Bestseller. "The Work" picks up where "The Other Wes Moore" left off and follows Wes’s journey to the point where he discovered meaning in his work through service. While detailing his own path to purpose, "The Work" also profiles a dozen other inspiring people who have found their mission by uplifting their communities. Today, Moore’s mission is to help young people succeed and make the right choices through education and awareness alongside the support of their parents, teachers and mentors. Moore is the Founder and CEO of BridgeEdU, an innovative college platform that addresses the college completion and job placement crisis. BridgeEdU reinvents the freshman year in a way that engages students in real-world internships and service-learning opportunities in addition to core academic classes. An award-winning author, poet, and filmmaker, Sherman Alexie has been lauded by The Boston Globe as “an important voice in American literature.” His National Book Award-winning and semi-autobiographical novel, “The Absolutely True Diary of a Part-Time Indian,” chronicles the contemporary adolescence of one Native American boy as he attempts to break away from the life he was destined to live. Join him as he speaks about his life and the book that serves as Marietta College’s common reading for this year. The author will speak on campus as part of the Esbenshade Series at 8 p.m., Wednesday, Sept. 10, on Fenton Court. When journalist and traveler Kelsey Timmerman wanted to know where his clothes came from and who made them, he began a journey that would take him from Honduras to Bangladesh to Cambodia to China and back again. Where Am I Wearing? intimately describes the connection between impoverished garment workers' standards of living and the all-American material lifestyle. By introducing readers to the human element of globalization — the factory workers, their names, their families, and their way of life — Where Am I Wearing bridges the gap between global producers and consumers. The book keeps with the College Theme of Internationalization: Global Perspectives for the 2013-14 school year. The author will also speak on campus as part of the annual Esbenshade Series at 7:30 p.m., Tuesday, Sept. 10, on Fenton Court. The Other Wes Moore tells the story of two kids with the same name, living in the same city. One grew up to be a Rhodes Scholar, decorated combat veteran, White House Fellow, and business leader. The other is serving a life sentence in prison for felony murder. Told in alternating narratives that take readers from heart-wrenching losses to moments of surprising redemption, the book tells the story of a generation of boys trying to find their way in a challenging and at times, hostile world. The author graduated Phi Theta Kappa as a commissioned officer from Valley Forge Military College in 1998 and Phi Beta Kappa from Johns Hopkins University in 2001 with a bachelor’s degree in international relations. He completed a master of letters degree in international relations from Oxford University as a Rhodes Scholar in 2004. He went on to be a paratrooper and Captain in the United States Army, serving a combat tour of duty in Afghanistan with the elite 1st Brigade of the 82nd Airborne Division in 2005-06. A White House Fellow in 2006-07, Moore served as a Special Assistant to Secretary of State Condoleezza Rice. Following his time at the White House, Moore became an investment professional in New York at Citigroup, focusing on global technology and alternative investments. The book keeps with the College Theme of Leadership and Social Justice for the 2012-13 school year. The author also spoke on campus as part of the annual Esbenshade Series at 7:30 p.m., Tuesday, Nov. 13, at the Alma McDonough Auditorium. Fuller describes the life and death of the young man in Wyoming who lost his life on an oil rig. According to Fuller’s book, between 2000-06, Bryant was among 35 people who died in Wyoming’s oil and gas industry. After his death, Bryant’s company was fined $7,000 for safety violations, while boasting record profits the same year. Bryant’s family never received compensation. The book keeps with the College Theme of Energy and Environment for the 2011-12 school year. The author also spoke on campus as part of the annual Esbenshade Series at 7:30 p.m., Wednesday, Nov. 9, at the Alma McDonough Auditorium. The book keeps with the College Theme of Health and Wellness for the 2010-11 school year.